Campbell, Beverly et al. "Beetle". The Canadian Encyclopedia, 04 May 2017, Historica Canada. https://www.thecanadianencyclopedia.ca/en/article/beetle. Accessed 19 April 2019. Beetles are an extremely diverse group of insects, which together make up the order Coleoptera (from Greek koleos, meaning, “sheath,” and ptera, “wings”). So named for their hardened forewings, which conceal a second pair of flight wings, beetles have the greatest number of known species of any comparable group of living things. There are an estimated 380,000 described beetle species worldwide, representing about 40 per cent of the world’s known insects. Beetles occupy nearly every available terrestrial and freshwater habitat, having evolved to fulfill more ecological roles than probably any other group of organisms. As such, beetles are found all over the world. In Canada, over 8,150 species are known, representing 121 of the world’s 176 families of beetles. Familiar beetles include lady beetles, fireflies, scarabs, weevils, tiger, ground, blister and leaf beetles. Dogbane leaf beetle (Chrysochus auratus). Photo taken on 14 September 2014. Adult beetles are compact insects with very hard exoskeletons. Their front pair of wings is modified into a pair of hardened coverings called elytra, protecting their flexible hind wings (used for flight), which are elaborately folded beneath the elytra. Beetles are easily recognized by the straight line formed where the elytra meet along the back of the body. Larvae and adults generally have chewing mouth parts, with very hard jaws (or mandibles). Adult antennae vary from very short to very long and usually have 11 or fewer segments. Beetles range in size from 0.25 mm to 20 cm long. Larvae typically have a hardened head capsule, a pair of mandibles, and three pairs of legs near the front end of the body; some larvae are grub-like, with or without legs, while others may be more slender and mobile, with long legs. 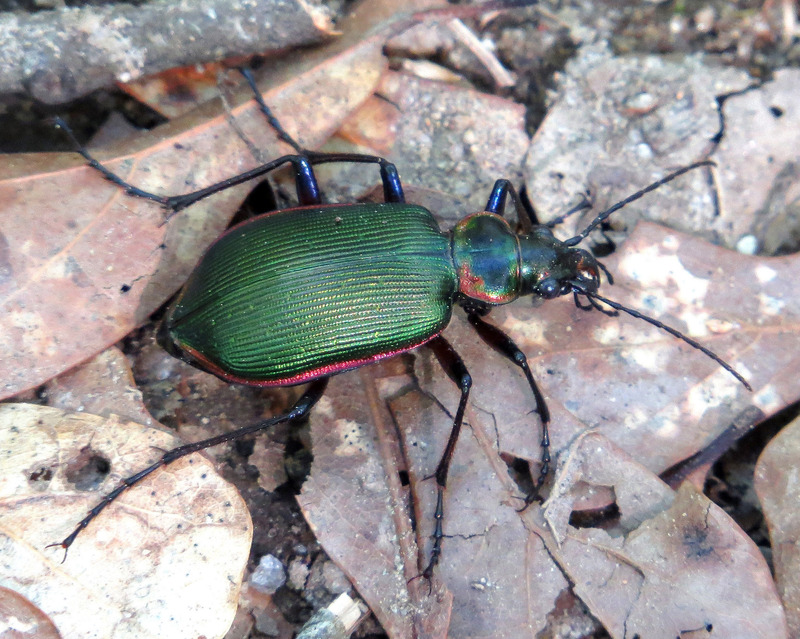 A species of ground beetle (Calosoma scrutator). Photo taken on 24 April 2014. Elderberry borer (Desmocerus palliatus) is a species of longhorn beetle. Photo take on 15 June 2015. An acorn weevil (Curculio nasicus). Photo taken on 1 June 2013. Beetles exhibit a huge variety of structural modifications, depending on their preferred habitat. For example, diving beetles (Dytiscidae), water scavenger beetles (Hydrophilidae), and whirligig beetles (Gyrinidae) all have large, broad midlegs and/or hindlegs which function like paddles to propel them through the water; their bodies are covered in water-repellent hairs, surrounding them in a thin layer of air while submerged, which serves as a temporary oxygen store. On the other hand, ground-dwelling beetles, such as ground beetles (Carabidae) and darkling beetles (Tenebrionidae) have long, slender legs that allow them to move quickly across the ground, while beetles that bury into the ground often have broad, flattened legs fringed with teeth or spines, useful for digging. Other recognizable structural modifications of beetles include the very long antennae of longhorn beetles (Cerambycidae), the long snouts of weevils (Curculionidae), and the enlarged mandibles of male stag beetles (Lucanidae), which in many species are more than half as long as the rest of the body. Most Canadian beetles are brown or black, although a wide range of colours and patterns occur. Colour may be produced by modifications to the microscopic structure of the cuticle (the outer covering of the body) leading to a metallic green or blue appearance, or by pigments in the cuticle, producing oranges, reds, yellows, etc. 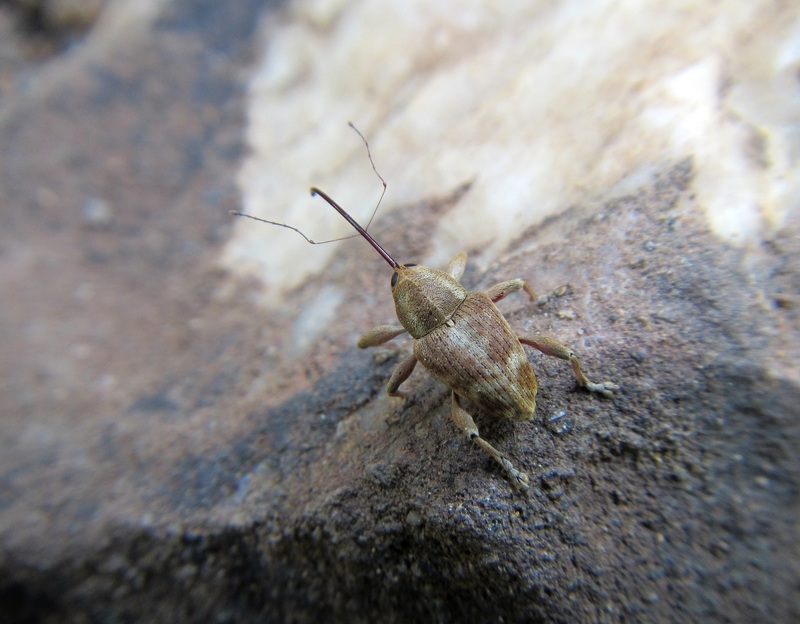 Beetles may be herbivores, predators, scavengers, detritivores, or parasites. This diverse range of living strategies is reflected in their extremely varied habitats. In Canada, the number of beetle species is generally greater at lower latitudes, though they occur throughout the country, and can be found at least as far north as Hazen Camp in Quttinirpaaq National Park, Nunavut. The six-spotted tiger beetle (Cicindela sexguttata). Photo taken on 25 March 2016. As predators, beetles normally attack other creatures of similar size. Some, like diving beetles, whirligig beetles and tiger beetles, are generalist predators (i.e. they’ll eat anything) both as adults and larvae. The metallic green six-spotted tiger beetle (Cicindela sexguttata) is a common springtime sight along forest paths, where it sits in sunny spots awaiting prey. Many ground beetles are more specialized predators, such as the caterpillar hunters (Calosoma spp.) and snail-eating beetles (Scaphinotus spp. 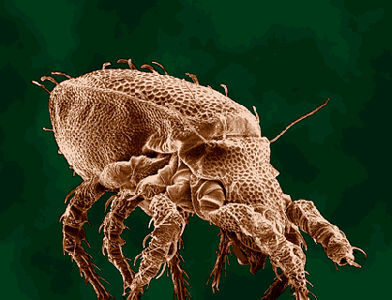 ), preying on invertebrates that would otherwise be considered pests. 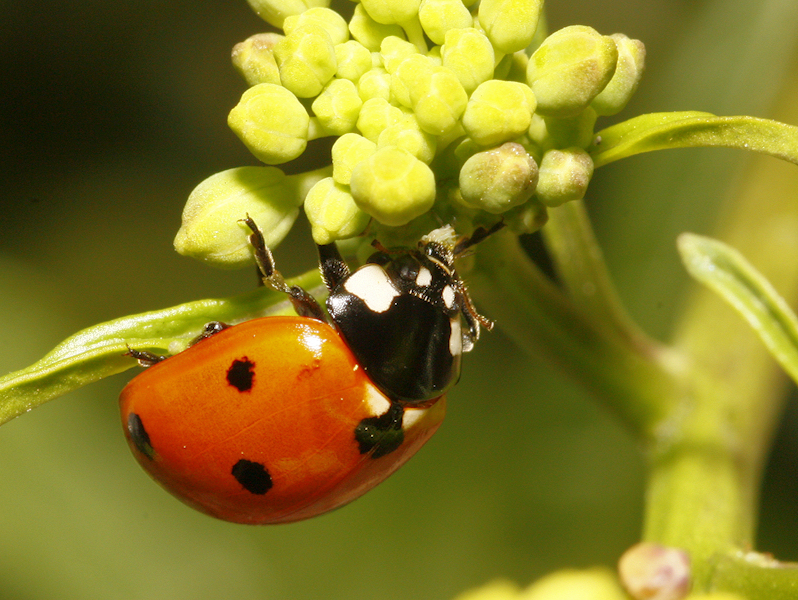 Lady beetles (Coccinellidae) are similarly beneficial specialists, preying on aphids and other pests. A Japanese beetle (Popillia japonica). Photo taken on 7 July 2013. Most beetle species are herbivores, feeding on the leaves, buds, flowers, stems, or roots of virtually every plant species, living or dead. Leaf beetles (Chrysomelidae) are especially diverse leaf-eaters; many are brightly coloured, warning predators of the toxins acquired from their diets, or are green, making them tough to spot on their food plants. 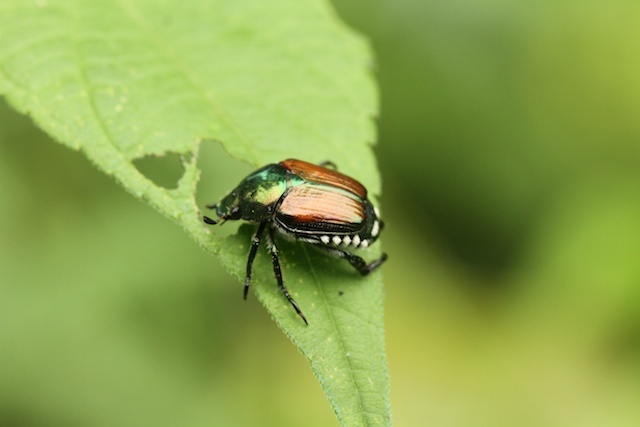 Many scarab beetles (Scarabaeidae) feed on roots as larvae, and on leaves, buds, and flowers as adults, such as the introduced Japanese beetle (Popillia japonica), a destructive pest of rose bushes and other plants. Milkweed longhorn beetles (Tetraopes spp.) similarly feed on roots of milkweed as larvae, incorporating the plant’s toxic alkaloids into their bodies; adults feed on above-ground plant parts, and are protected by these toxins from predators (their striking red-and-black appearance is a warning of their toxicity). 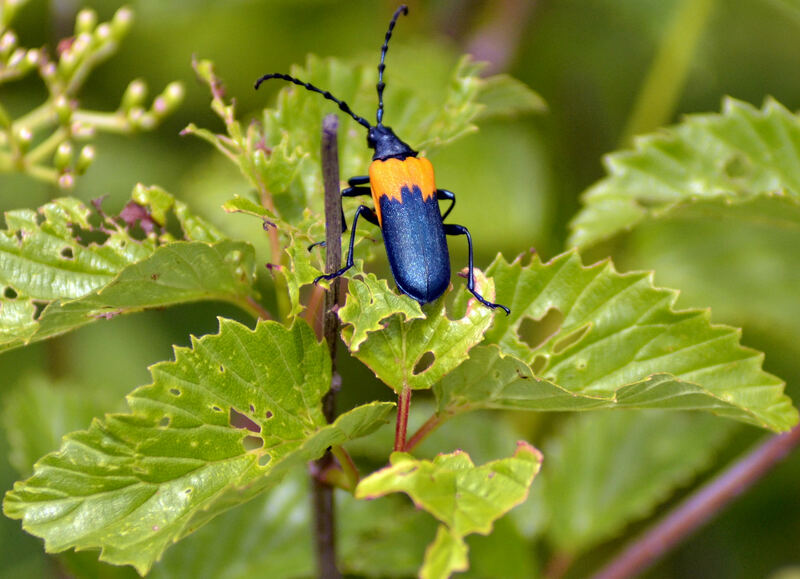 Many beetles visit flowers to feed on pollen, such as the flower longhorns (Cerambycidae) and soldier beetles (Cantharidae), common on goldenrods and other pollen-rich flowers. Some pollen-eating scarabs mimic bumblebees in appearance and behaviour in order to deter predators (e.g. the bumblebee flower beetle, Euphoria inda). A patent-leather beetle (Odontotaenius disjunctus), a species of Bess beetle. Photo taken on 24 June 2013. As wood borers, beetles attack living, dead, fallen, or rotting wood. 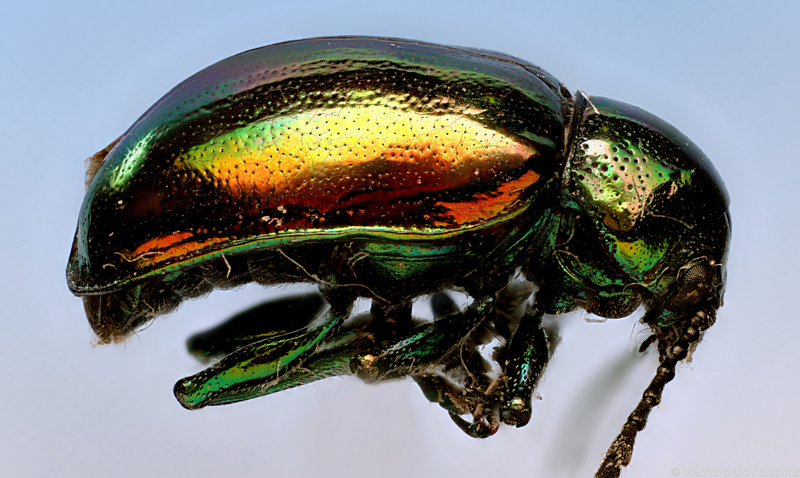 Jewel beetles (Buprestidae) and longhorn beetles include many species which bore into trees as larvae, while adults are often predators or leaf-eaters. Bess beetles (Passalidae) live in rotting wood, and larvae are fed pre-chewed wood by parents (one species, Odontotaenius disjunctus, is found in Eastern Canada). Weevils (Curculionidae) are particularly diverse herbivores: with over 60,000 described species, they are the largest family of animals known. Many feed on leaves, while others bore into buds, fruits, nuts, and seeds, and lay their eggs inside these structures. Bark beetles (Scolytinae and Platypodinae) are specialized weevils that bore through wood just beneath the bark, and their distinctive galleries (wavy larval tunnels leading away from a wide central chamber) are easy to spot on affected wood5. Some bark beetles, known as ambrosia beetles, actively cultivate ambrosia fungus as food. 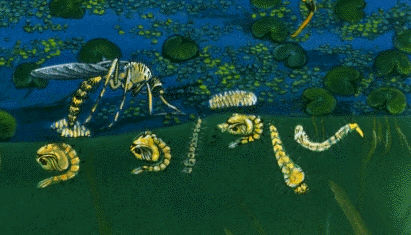 Adults and larvae live together in small colonies, in which the tasks of maintaining the tunnels, tending the fungus crops, and defending the colony are split between them. As scavengers and detritivores, various groups of beetles feed on decaying plant and animal matter and dung. Carrion beetles (Silphidae) are commonly found on animal carcasses, and include the burying beetles (Nicrophorus spp. ), which bury carrion (freshly dead animal flesh) in underground chambers where they raise their young. Dung beetles are scarab beetles with a similar habit: many species roll dung into balls, which they bury underground to provide a food source and home for their larvae. Beetles undergo complete metamorphosis, with different life stages typically being active during different seasons or in different habitats, such that they do not compete with one another for resources. Adult beetles locate mates using various techniques, whether by scent, sight, or sound. Many species rely on pheromones to attract mates, and males of some species have highly-branched antennae packed with tiny sensory structures that “smell” or “taste” the air for these and other chemicals. Others produce audible sounds as mating calls by rubbing one body part against another — this is called stridulation. Both adult and larval bess beetles squeak in this manner, producing mating calls and alarm signals, though sound may also be used to startle predators. Fireflies (Lampyridae) have perhaps the most familiar mate-finding strategy, which relies on biologically-produced light, or bioluminescence. The bright flash of light is achieved by an extremely efficient chemical reaction, which takes place in a special light-producing organ found at the tip of the abdomen. Typically, males fly around on summer nights flashing a specific pattern, until a female, usually watching from the ground, flashes back the corresponding pattern. Most female beetles need to mate only once, and will fertilize their eggs using sperm stored in a special sac called a spermatheca. Fertilized eggs are laid singly or in groups, usually on or near a suitable food source. In most beetles, parental care extends no further than this, but in some species it can be much more extensive. The burying beetles (Nicrophorus spp.) exhibit the greatest extent of parental care: adults first bury an animal carcass in an underground chamber, then remove its fur or feathers and coat it in a preservative saliva to slow decomposition, and will even provide larvae with their first meals by regurgitating pre-chewed animal flesh (similar to birds feeding their chicks). Larvae vary from being relatively sedentary plant feeders to active predators; some tunnel through plant matter, such as leaf miners and wood borers, while others feed on plant roots in soil, graze on algae underwater, etc. Once fully grown, larvae usually develop into pupae in specially-constructed chambers either in soil or in the tissues of their food plants. In Canada, many beetles spend the winter as pupae, although some aquatic beetles remain active beneath the ice. A lady beetle, also known as a ladybug (Coccinella novemnotata). Photo taken on 8 February 2009. As a group, beetles’ vast array of ecological roles makes them some of the most beneficial animals on the planet. Many herbivorous groups feed on plants that are normally considered weeds, including many weevil and leaf beetle species, some of which have been deliberately introduced to control invasive plants. Many predatory groups, such as ground and rove beetles, feed on destructive insects and regulate their populations, providing an important service to agriculture. Lady beetles (also called ladybugs; Coccinellidae) are probably the most familiar beneficial predators, and are commonly recruited to control aphids, scale insects and mealy bugs. Their reputation for pest control is such that upwards of 179 species of lady beetles have been intentionally introduced to North America at one time or another – about 17 of those are now established. The Colorado potato beetle (Leptinotarsa decemlineata). Photo taken on 11 May 2014. Beetles also include many of the most destructive insect pests known. Many species attack stored grains and cereals, while plant feeders and wood borers attack virtually all cultivated crops and nearly all trees and shrubs. Some of these species carry plant diseases, such as Dutch elm disease, the result of a fungal infection transmitted by both native and invasive elm bark beetles. Many destructive beetle species are invasive in North America, but a number are native here. 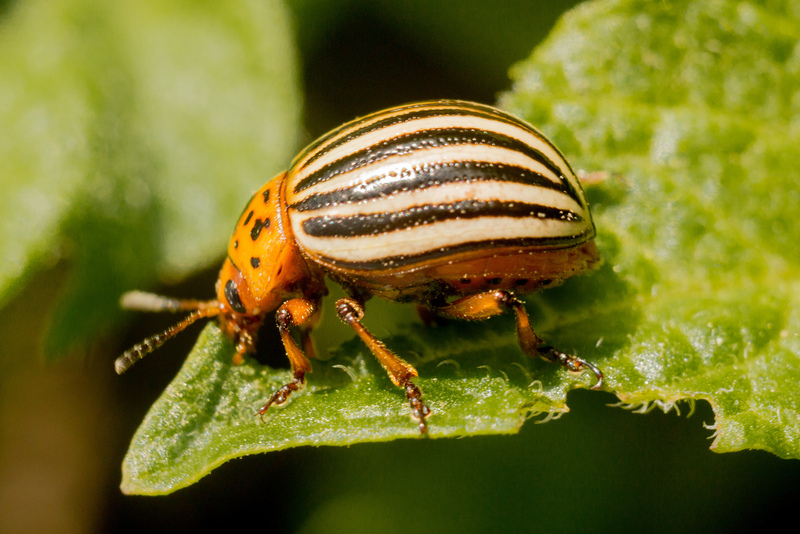 For example, the Colorado potato beetle (Leptinotarsa decemlineata) is a major pest of potato crops in the Northern Hemisphere which spread from its likely native range in Mexico alongside cultivated potatoes. 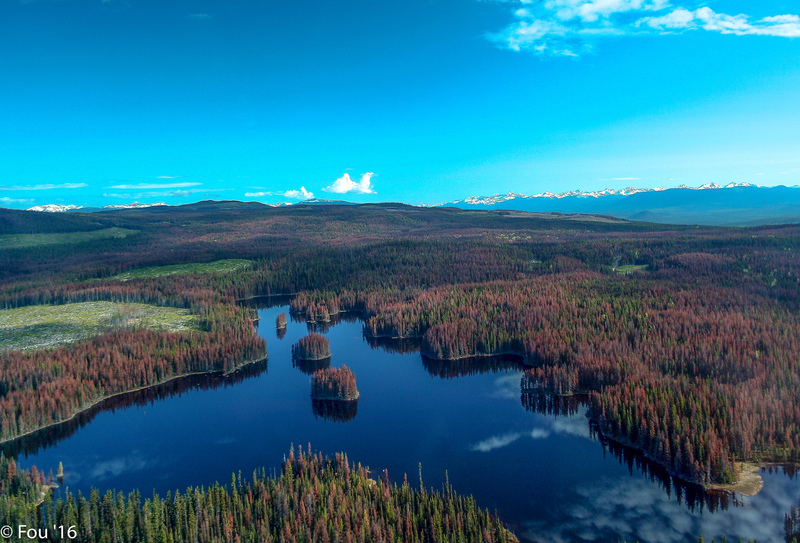 Red trees indicate a mountain pine beetle infestation in forests near Clearwater, British Columbia, part of the Fraser River basin. Photo taken on 30 May 2008. Asian long-horned beetle (Anoplophora glabripennis). Photo taken on 25 June 2015. 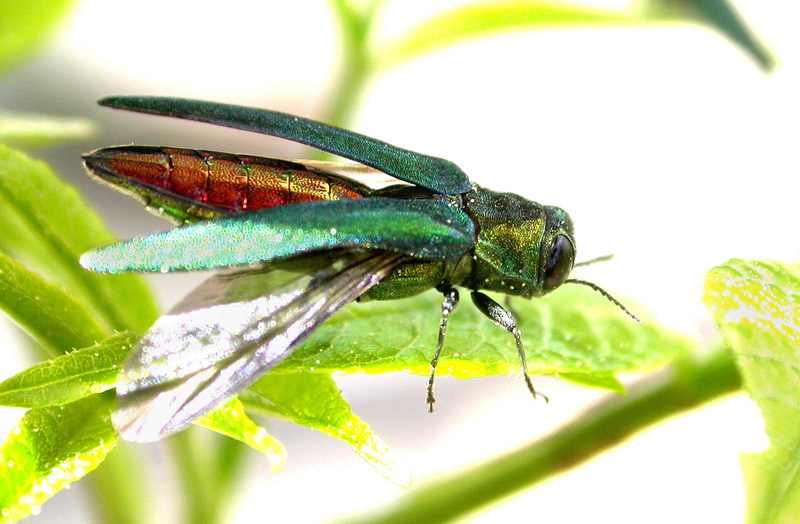 Emerald ash borer (Agrilus planipennis). Photo taken on 20 May 2013. In forestry, several beetle species are actively monitored and controlled in order to limit damage. The mountain pine beetle (Dendroctonus ponderosae) is an outbreak pest native to western North America, where it attacks and kills several species of pine; since the current outbreak started in the early 1990s, it is estimated to have caused a cumulative loss of 58 per cent of all merchantable pine in British Columbia. 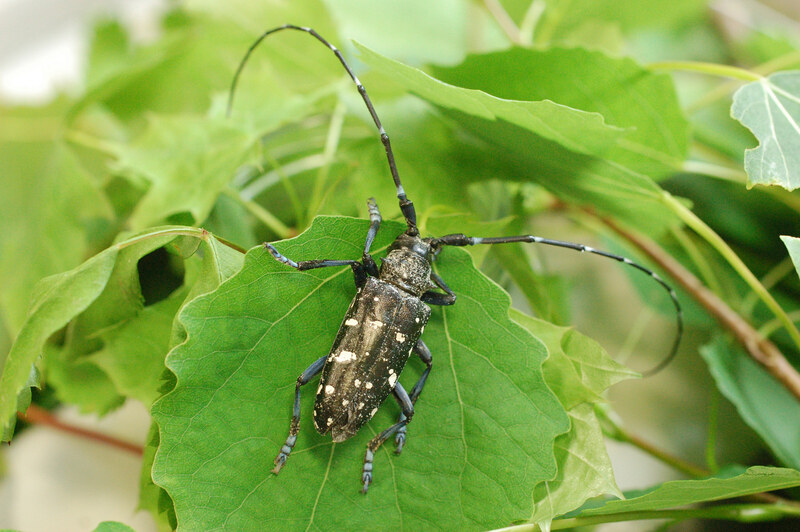 In Southern Ontario and Québec, two invasive wood-boring species are subject to strict control programs: the emerald ash borer (Agrilus planipennis) and Asian long-horned beetle (Anoplophora glabripennis). The emerald ash borer attacks and kills most ash trees in its invasive range, with potentially huge impacts on natural and urban landscapes; since 2002, it has gradually spread northward, reaching Thunder Bay in 2016. To prevent the spread of both species, the movement of wood products out of regulated areas is prohibited. Beetles do very little direct damage to humans and domestic animals, although carpet and museum beetles (Dermestidae) are a common nuisance in homes and museums, where they feed on animal-derived products, such as wool and leather, and damage collections of pinned insects and taxidermized vertebrates. 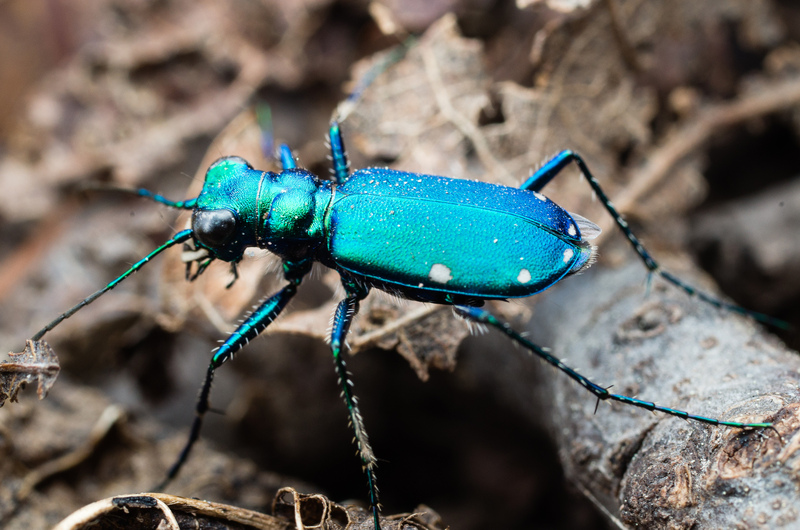 Some beetle-derived substances can also be dangerous to humans: blister beetles (Meloidae) produce a potent toxin called cantharidin, which they release from their leg joints when disturbed, and which can cause painful chemical burns if it touches skin. Cantharidin is also the principal component of Spanish fly, a purported aphrodisiac derived from a blister beetle of the same name, which can be deadly even in small doses. Beetles have fascinated humans throughout history. Scarabs were religious items to Ancient Egyptians and ornamental scarabs were made in Ancient Greece from precious stones and metals. Beetles have inspired many individuals to study natural history and biodiversity — Charles Darwin himself had a notable interest in collecting and studying beetles. 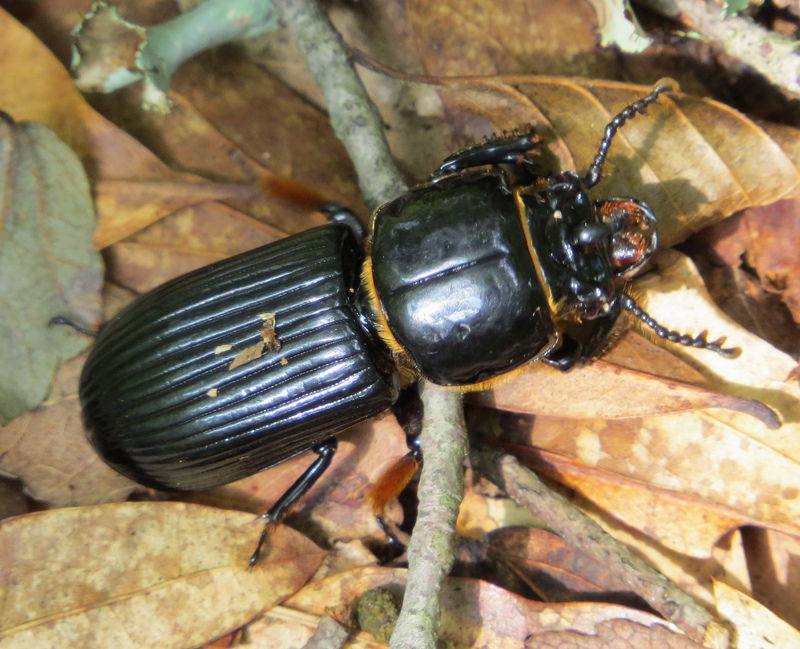 Today, scarab and stag beetles are popularly bred and kept as pets, especially in Japan, and certain beetles are reared commercially as food for humans and pets — for example, mealworms (Tenebrio molitor) and palm weevil grubs (Rhynchophorus spp.). Arthur V. Evans, Beetles of Eastern North America (2014). Richard E. White and Roger T. Peterson, A Field Guide to Beetles of North America (1983). Agriculture and Agri-Food Entomological MonographsThis website lists handbooks (in PDF format) about Canadian insects, including four beetle groups: bark beetles, carrion beetles, metallic wood-boring beetles and weevils. Checklist of the Beetles of Canada and AlaskaThis government website lists all families, genera and species of beetle found in Canada and Alaska, with details of each species’ presence or absence in each province and territory.